How to safely confront a family "zone of silence"
And much more Filled with moving first-person stories, The Secret Life of Families provides perspective on some of today's most sensitive personal and social issues. Giving voice to our deepest fears and to our power to overcome them, this is a book that will be talked about for years to come. Secrets come in all shapes and sizes. And for families as well as individuals, they are built on a complex web of shifting motives and emotions. But today, when personal revelations are posted on the Internet or sensationalized on afternoon talk shows, we risk losing touch with how important secrets are--how they are used and abused, their power to harm and heal. Filled with moving first-person stories, The Secret Life of Families provides perspective on some of today's most sensitive personal and social issues. Giving voice to our deepest fears and to our power to overcome them, this is a book that will be talked about for years to come. Secrets come in all shapes and sizes. And for families as well as individuals, they are built on a complex web of shifting motives and emotions. But today, when personal revelations are posted on the Internet or sensationalized on afternoon talk shows, we risk losing touch with how important secrets are -- how they are used and abused, their power to harm and heal. -- How to safely confront a family "zone of silence"
"A must-read book--daring, compassionate, timely, and eminently useful." --Harriet Lerner, Ph.D., author of The Dance of Anger and The Dance of Deception "What a pleasure!...Wise and discerning." --Donald A. Bloch, M.D., Past President, American Family Therapy Academy "[A] powerful, groundbreaking book...Brave, compelling, and important." Evan Imber-Black, Ph.D., is Director of Program Development at the Ackerman Institute for the Family in New York City and Professor of Psychiatry at the Albert Einstein College of Medicine. She is also immediate past-president of the American Family Therapy Academy. Her previous books include Rituals for Our Times (with Janine Roberts, Ed.D.) 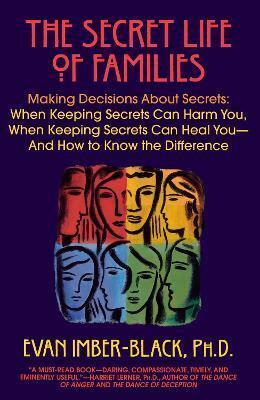 and the professional book Secrets in Families and Family Therapy, which she edited. The mother of two grown children, she lives with her husband in Westchester, where she practices family therapy.